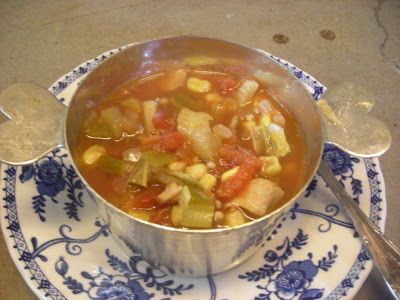 It's summer and often we have more vegetables than we know what to do with -- and so I decided to take the odd peppers and onions and okra and tomatoes and a bit of leftover corn and make gumbo. And since this was "leftover" soup, I found a package of grilled chicken breasts in the fridge which we had not eaten yet. But not just grilled breasts but ones that had been marinated first in a spicy ginger teriyaki sauce before they were grilled. An accidental soup, made from leftovers, became our favorite gumbo. We made it again and started first by marinated chicken breasts in the spicy ginger teriyaki sauce before they were grilled and placed in the gumbo -- this gumbo made entirely of vegetables bought FOR the gumbo! 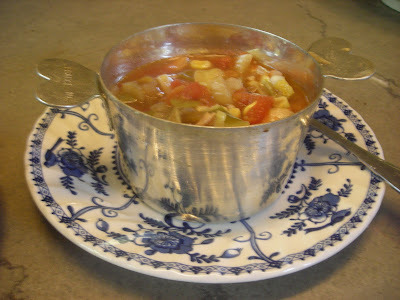 A favorite way to serve a first course soup for two (or even four) is in our individual charlotte molds -- the metal keeps the soup hot and it truly is a perfect size for a first course. Sometimes something made on the fly turns out to be something really good. 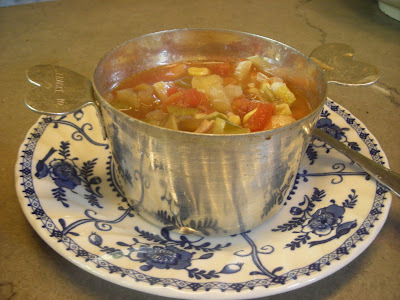 I must admit that our gumbo is like no other -- the secret is in the spicy Asian chicken! It's Monday and time for "Blue Monday" -- come and visit Smiling Sally and see what other Blue Monday treats she has in store. Every one knows I love blue and white. Any and all patterns but mostly English. I personally think that all blue and white work well together. There is blue and white old and new on the table this morning -- and more than one maker as well -- from Spode's Blue Room (reproductions of the wonderful English transferware) to Johnson Brothers Indies to some Blue Willow (bought and brought back from England) to a wee Blue Willow cream pitcher and sugar bowl -- perfect for two. 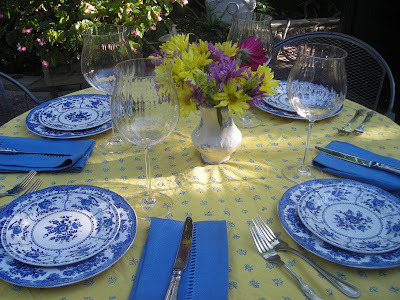 But there is enough blue in the dishes and so placemats and napkins ARE NOT blue! 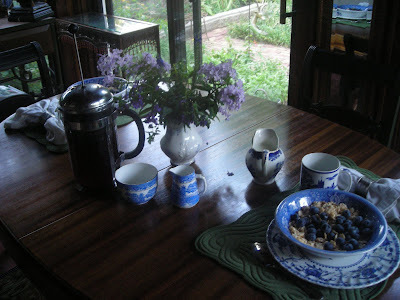 And to make this Monday even bluer -- blueberries atop the cereal! I find it hard to pass up a piece of blue and white -- whether it is china for the table or vases or ginger jars for tabletops. We have some blue and white that's really old but yet we have some newer pieces as well and ALL of it works well together. 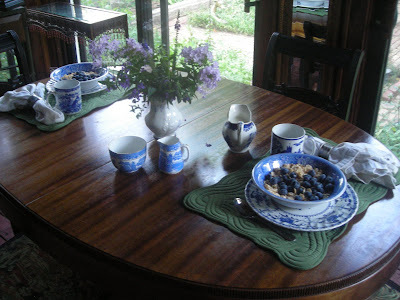 I think I love blue and white because it goes with so many colors and there is something classy about transferware and oriental bowls. This post was originally written on June 2, 2008 -- when Lines at Linderhof was still in its infancy. 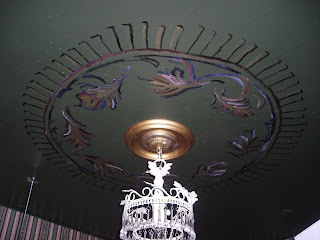 Plain white ceilings are not part of Linderhof but not all have decorative painting around the light fixture. 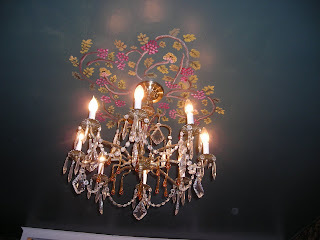 I'm pleased with our ceilings and wanted to share them with you again. 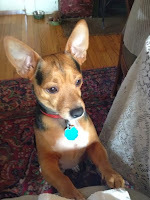 Please join Chari at Happy to Design and see what everyone's Sunday Favorites are. You Say Tomayto -- I Say Tomahto! 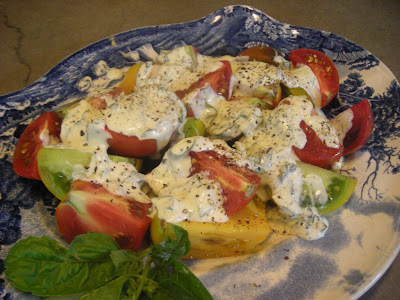 Summer meals often include tomatoes and this made a wonderful first course for a summer dinner. Not one but four different kind of heirloom tomatoes (including one from Linderhof's garden) quartered and arranged on a plate. Topped not with oil and balsamic vinegar but rather a basil mayonnaise. And finished with salt and lots of pepper. It's an easy to make dressing -- boughten mayonnaise with a squeeze of lemon juice, salt and pepper and LOTS of chopped basil. 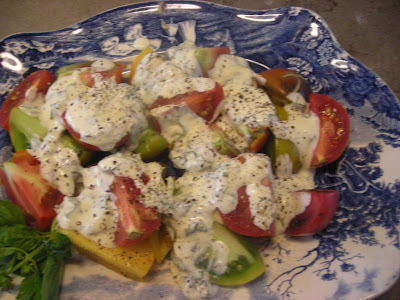 Letting it sit for a while makes it even better for the basil then really infuses the mayonnaise. 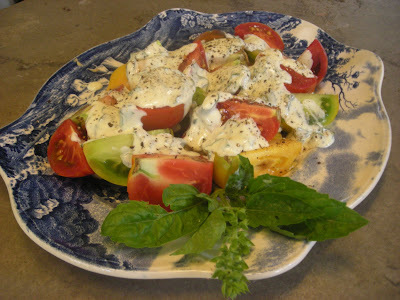 The three colors of tomatoes on a blue and white plate, garnished with green basil made for a pretty dish. 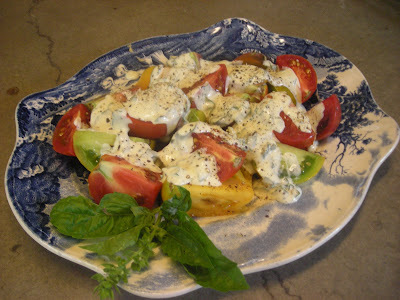 It was tasty as well and the thing we hate about fall coming is that tomatoes will soon be but a memory. Not Hard As a Rock But Shaped Like a Brick . . .
Our little town on the prairie used to make bricks. In fact, it was a BIG industry at one time. Think bricks for the Panama Canal. Think bricks for the Indianapolis Speedway. All of those bricks came from Ft. Scott. And as all brickmakers did in that area -- they stamped their name ON the brick! But this isn't a decorating post -- it's a Foodie post because today is Foodie Friday. 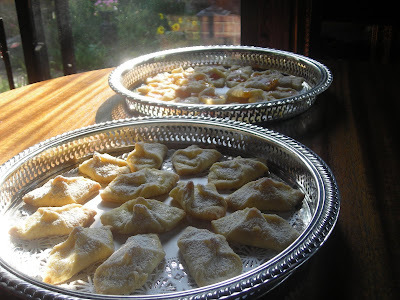 And it isn't about a Food Trainwreck either -- cookies that came out as hard as those bricks and were inedible . . .
No, it's about cookies that came out shaped like a brick . 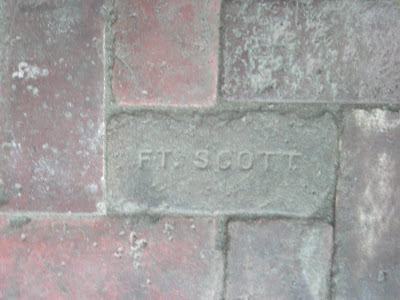 . .
And like the real bricks imprinted with the name Ft Scott. 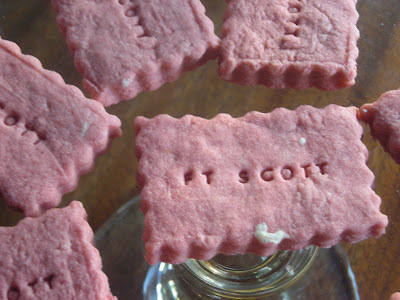 They're made with a special cookie cutter that I badly wanted but couldn't justify the price just so I could imprint "lavande" on my lavender shortbread. But our Tourists Visitors Center gives cookies away to our visitors. 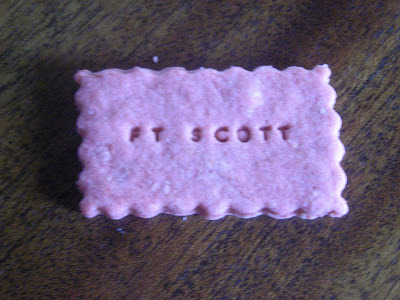 And what better cookie to give than one which reminds them of our brick factories and our brick streets. For THAT reason, I could justify the cost of the cookie cutter. I do think the cookies have a good resemblance to the real bricks. 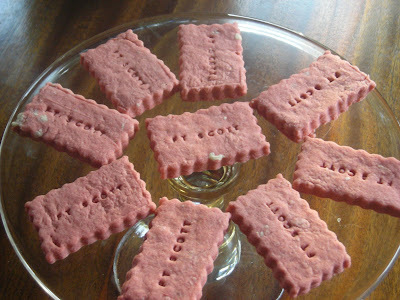 And, when I make lavender shortbread, I can use the cutter to imprint them as well! It's Foodie Friday, so please join Michael at Designs by Gollum and see what everyone has been cooking this week! 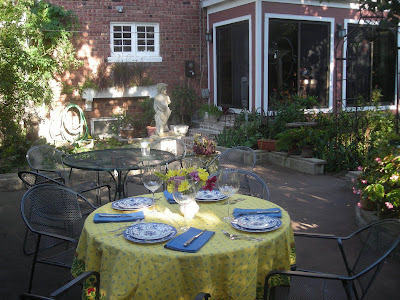 We love to dine on the patio on nice evenings. Whether it is just the two of us or company. For the patio we chose two round tables which can be pushed together to form one larger "figure 8" table. But last week it was just 4 of us -- so one table it was. The provencal tablecloth from Williams Sonoma last year. Two of them -- one for each table. Love the sunny yellow and the hints of blue. Napkins were a bit harder -- tried yellow and they didn't go well, have used red and green and both choices were less than stellar. 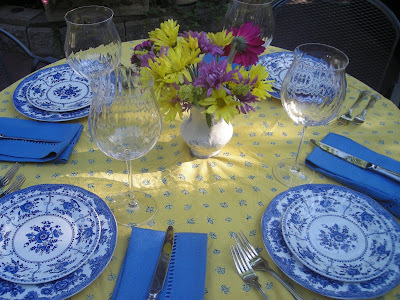 But the blue napkins pick up the blue in the tablecloth and the blue in the dishes. Napkins, too, are from Williams Sonoma -- picked up on their sale table for a fraction of the original price. They're perfect! 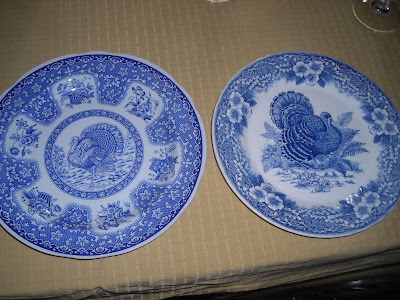 Blue and white dishes -- the Johnson Brothers Asiatic Pheasant used and bought for patio dining. The Johnson Brothers Indies plates -- used tonight not for salad but for appetizers -- smoked poppers and drunken tomatoes. A gay bouquet of garden flowers for the centerpiece. Not too high, conversation at Linderhof around the dining table is highly prized! We had special guests that evening for dinner -- daughter Sarah and her Andy. All the way from Minnesota. 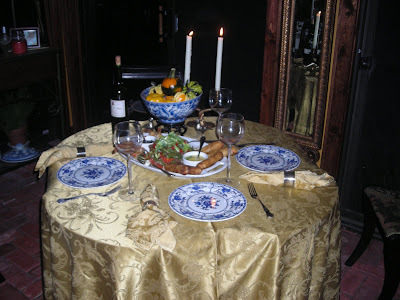 A special night, a special dinner, special wines. A menu worthy of al fresco dining -- Tuscan grilled chicken, caprese salad, roasted new potatoes, tiny onions and fresh green beans. The wines -- some great Italian whites. 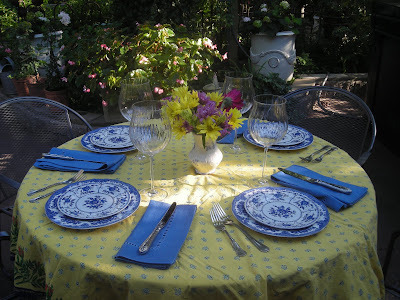 Please join Susan at Between Naps on the Porch to see the great tablescapes that are always posted on Thursday. It is a fun event and one I so look forward to participating in. I love garden pots. Especially stone or concrete or iron ones. They are great in the garden. I've got them scattered here and there throughout the garden -- filled with mostly summer annuals. 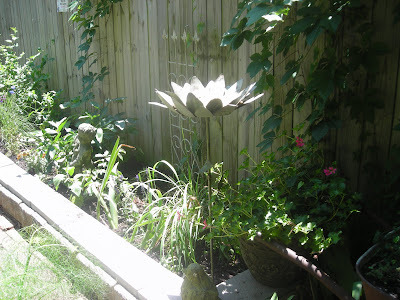 A great concrete planter with the geraniums in it -- it looks aged but isn't. A splurge at my favorite garden store, Red Cedar Gardens. 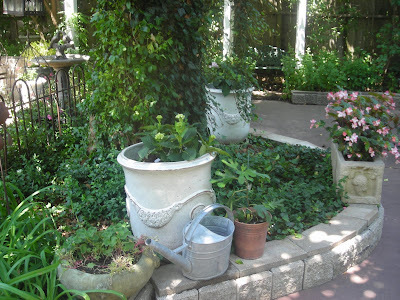 Actually four square planters that I bought early on for Linderhof's front -- to hold the summer geraniums or begonias. 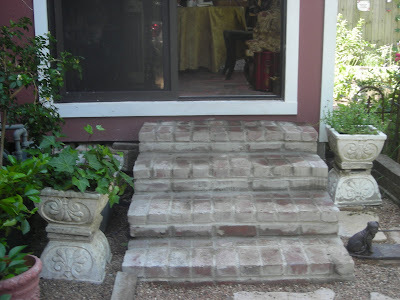 I have since replaced them and by turning one upside down and one right side up, they make the perfect addition to each side of our new brick stairs. The left one is planted with ivy -- to be brought inside in the winter. The one to the right holds some purple summer annuals. 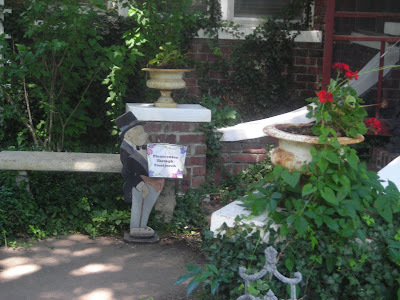 A planter that's a statue as well -- it's been moved here and there in the garden but has landed under the trees for a few years now. 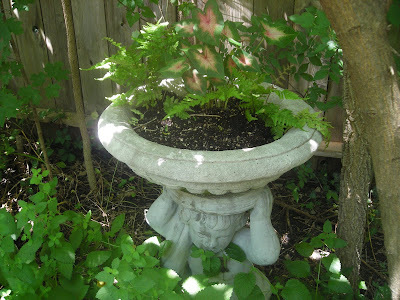 It holds ferns and caldiums -- shade loving plants. 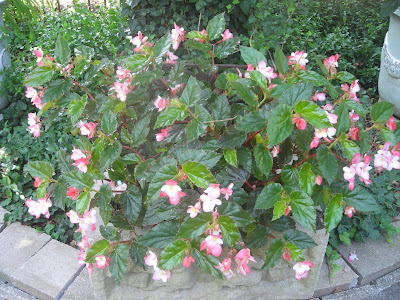 A begonia in one of my favorite concrete pots -- bought at a "steal" at Red Cedar -- the last one and marked way down. My two big French pots, the concrete pot from Red Cedar that was a "steal" and another Red Cedar purchase -- the lion's head pot. 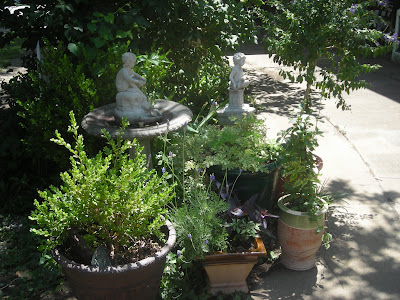 A group of planters that I see from my kitchen window -- mixed plantings from a dew drop tree to lavender in one of the pots to a couple of nice boxwoods (that need trimming). The planters at my front entrance -- iron with a bit of rusty "patina" -- filled this summer with red geraniums. My newest pot -- filled but not planted (which is why a bit of a wilt) with coleus. It's concrete, with a chip or two and a lovely mossy patina. An Estate Sale find for a "steal" -- $40. I saw it the first day of the sale but . . . when I went back the third day and everything was half off -- I snapped it up. 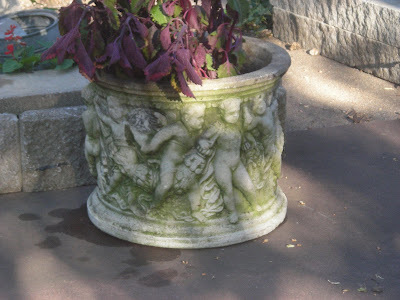 It's a nice addition to the Garden Pots at Linderhof. Next spring I'll plant it with purpose rather than just plopping something in. 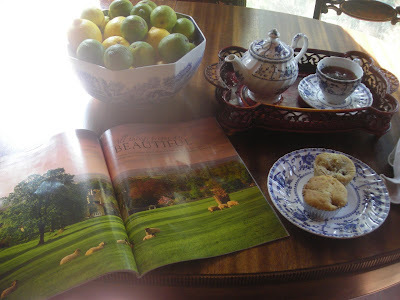 Please join Susan at A Southern Daydreamer to see everyone's outdoor adventures this Wednesday. 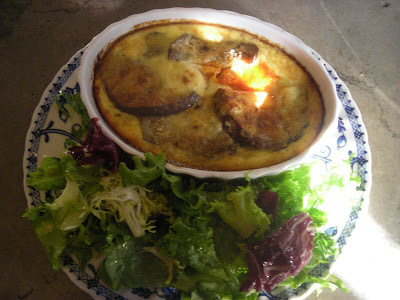 Perhaps our favorite lunch in the summer is Ina Garten's Eggplant Gratin. It's easy to do and makes a great lunch with a salad of baby greens. 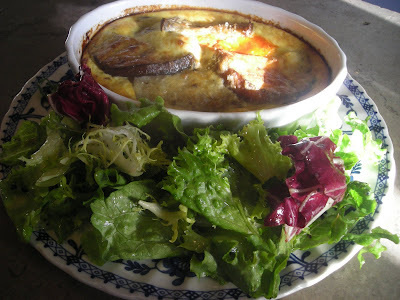 I like the fact that it is baked in individual gratin dishes -- and I like the fact that the recipe serves only two. 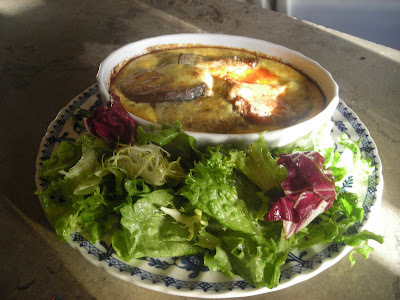 We have the eggplant gratin at least once a week during summer. From small skinny lavender eggplants to the bigger purple ones, any variety goes well in this dish. It's even good enough to serve to company although usually I make it just for the two of us. We like it better than eggplant Parmesan and feel that since it isn't breading that it is a bit healthier. until all the slices are cooked. Meanwhile, in a small bowl, mix together the ricotta, egg, half and half, 1/4 cup of the Parmesan, 1/8 t. salt and 1/8 t. pepper. 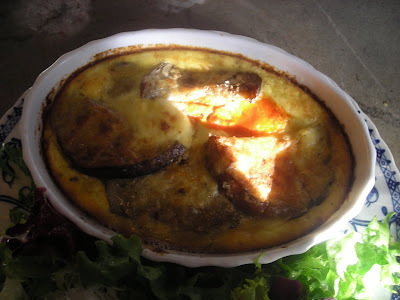 In each of 2 individual gratin dishes, place a layer of eggplant slices, then sprinkle with Parmesan, salt and pepper and spoon 1/2 of the marinar sauce. Next add a second layer of eggplant, more salt and pepper, half the ricotta mixture and finally 1 T. of grated Parmesan on top. Place the gratins on a baking sheet and bake for 25 to 30 minutes or until the custard sets and the top is browned. Serve warm. 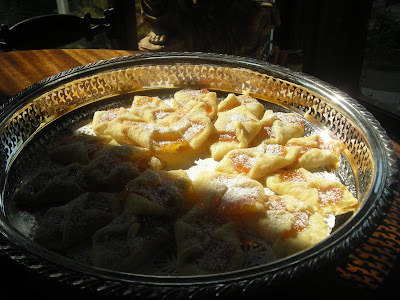 Friends of mine whose ancestors are Polish, asked if I could make some Kolackys for them. They were at every bakery in their neighborhood in Chicago but since moving to the prairie, they have been Kolackyless. At their request I made one recipe with apricot jam and one recipe with cream cheese. Once baked, they're finished with a shower of powdered sugar. THAT was a must, they said. 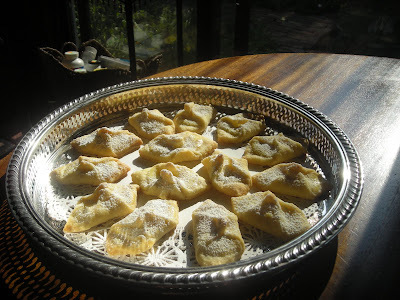 They're not a hard cookie and made a nice presentation in some of my silver trays. When they tasted the first one -- they said I "nailed" it. I felt good. It truly is an easy cookie to make and often one has all the ingredients on hand. 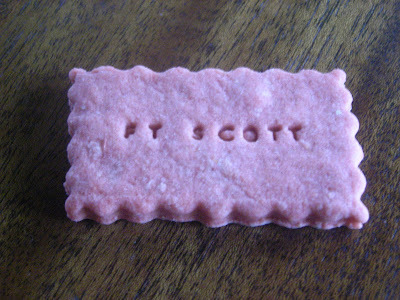 I think they would be a good cookie for afternoon tea. Combine butter, cream cheese and flour. Divide dough in half and chill. Roll out with rolling pin about 1/4 inch thick. I cut the cookies out with my 3 inch Ina scone cutter. Place on ungreased cookie sheet. 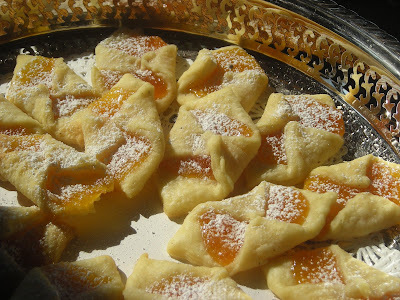 Top with 1/2 teaspoon apricot jam and bring sides up and pinch so that the filling is enclosed and the cookies are more of a rectangle. Bake in a 350 oven for 15 minutes or until jam bubbles and the cookies are very lightly browned on the bottom. 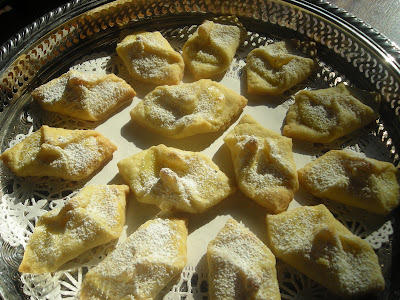 NOTE: For the cheese filling, I made a half recipe of Ina's filling for her cheese danish. It was perfect! The Story of the Basket . . . 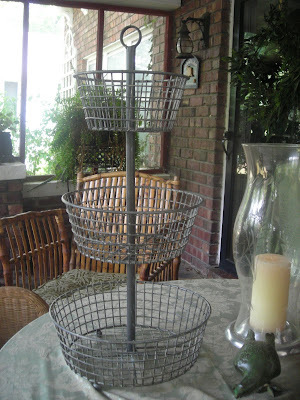 This wire basket fits in well at Linderhof. It has the look of age but yet is new. It can go inside as well as outside. And I love it!!!! 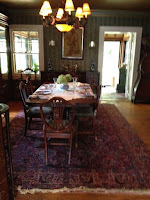 First seen at the Minneapolis Smith and Hawken when we visited Daughter Sarah and her Andy over the Fourth. I sat and debated about whether to purchase it -- I had found many other treasures and did I need it! The "didn't need" side of the debate eventually won and I decided that if I found that I really "needed" it that I could always order online. 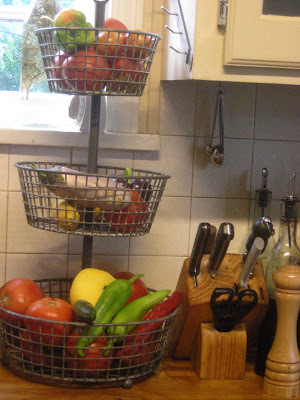 By the time I got home, I decided that I "needed" the basket and so online I went. There it was but alas, there was another item I wanted to order as well and that company didn't take Amex and so I thought I would bring my other card up tomorrow and would order both items on it. When tommorow came, I found out that Smith and Hawken was closing and that there were no more internet sales. The need turned into badly wanted and had to have. So I turned to my friends at a food board -- with my plea. Friends are wonderful whether they are internet friends or neighbor friends. Yes -- they lived near a S and H, would be happy to pick it up and mail it to me. And so, the calling began . . . .the first store said they would ship, but alas, they didn't have it and so I called store after store with no luck. One store DID have it but said that they couldn't ship anything but furniture. I pleaded that I would gladly pay him if he would personally ship but alas, he said no and was quite rude about it. But, then, perhaps I would be rude too if I was about to lose my job. Finally, in Birmingham I found one. A board friend in Huntsville had said her DD was going that weekend and so I said I wanted it (the last one, by the way), gave them my credit card and said that a friend would pick it up that weekend. An email from my friend said that when her DD went, there was no package for me. And so I waited, thinking perhaps that they were wrong about having one but when my credit card statement came, there it was . . . so the Birmingham store I called once again. Yes, my package was there awaiting pick up. No, they did not ship. I told the gentlemen on the phone my sad plight about being in Kansas, the store had said that there was no package for me when a friend went to pick it up and could he, please, personally mail it to me. There must have been sadness or desperation in my voice, because he said he would. 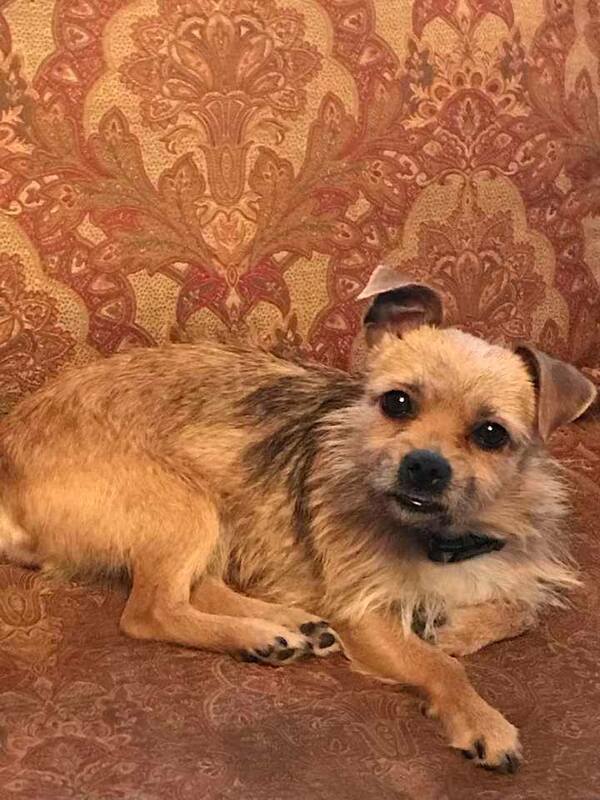 His name was Gene and he was the manager. About a week later it arrived. And after I got it, I wondered why I ever debated getting it in the first place -- it is PERFECT! 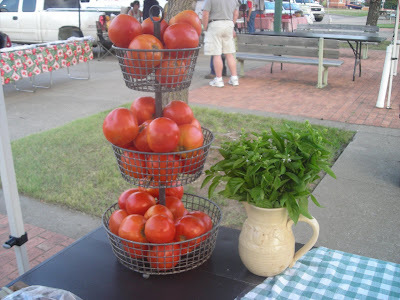 It looked great on the table when I did the Farmer's Market cooking demonstration. So great, in fact, that three vendors said how much they liked it and where did I get it -- it would be great for their booths. I smiled and replied that I got it far far from here. 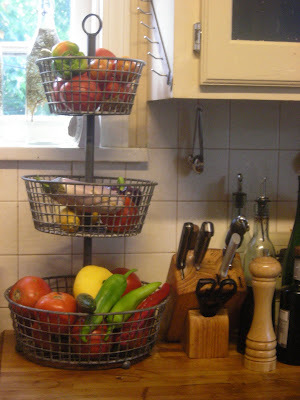 But it's main purpose is in the kitchen -- to hold those farmer's market vegetables. Three tiers of fresh goodness. Three tiers of summer's bounty. 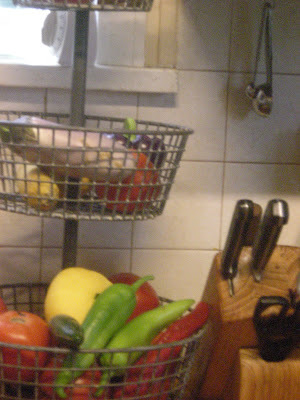 With the vegetables inside, it adds a bit of color to the kitchen and it's nice to have them so handy. 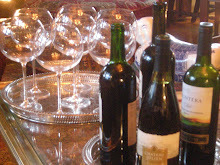 For they're on the chopping block -- right next to the stove. I feel silly that I passed it up in the first place. But it's nice to have friends and I want to thank Becky and her daughter for going out of their way for me. And, Gene, as well. Even though soon he will be without a job, he does understand customer service. I wish I could write him a letter of recommendation for his next job. 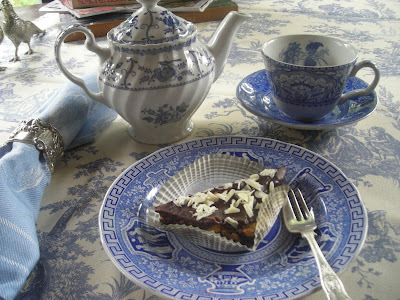 I am having a love affair -- with blue and white dishes!!!! I have scads and will bring home a plate, tureen or platter at the drop of a hat! 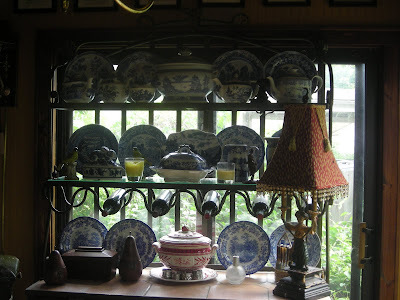 Here are many of my Spode pieces on the baker's rack in the breakfast room. I enjoy seeing them daily rather than having them hidden in a cabinets. Espresso cups and saucers are a flea market find -- I only have two blue and white ones but that's okay -- it's perfect for Husband Jim and I. 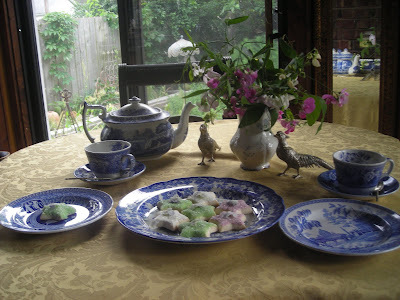 The plates are Wedgwood Asiatic Pheasant. One of THE patterns of English china done by many makers. A wee Indies pot, two cups and saucer brought home carefully on a trip to England. The pot -- perfect for my breakfast coffee! We have blue and white for Thanksgiving, too -- and if we run out of other blue and white plates -- the turkey plates can be pinched for service at any time of the year. Spode ones on the left and Mynot ones on the right. 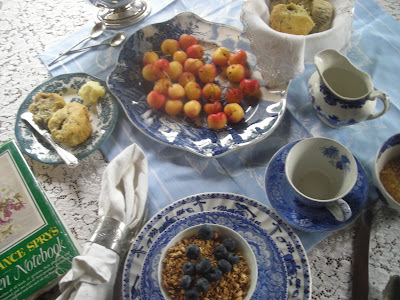 All blue and white go together, I think -- some Spode, Indies, the Wedgwood, Blue Willow, and an odd platter. 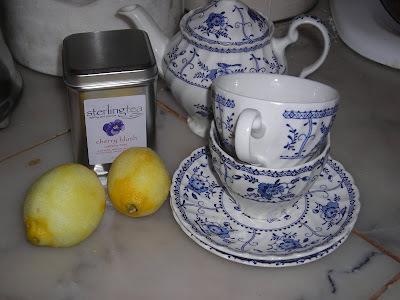 The little pot, perfect for my morning coffee or afternoon tea. 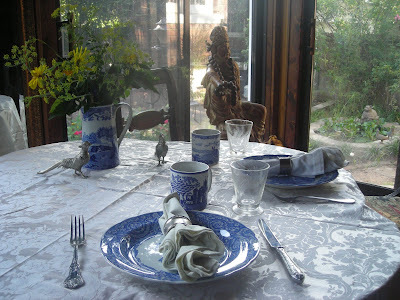 And my "affair" with blue and white extends to linens as well -- a toile tablecloth and jacquard napkins. 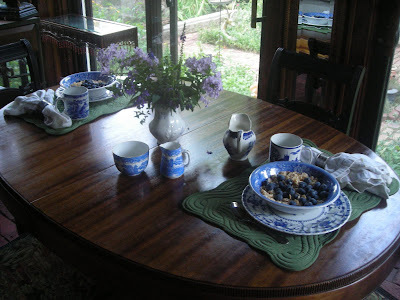 Centerpieces of bowls or pitchers add the "pretty" to my blue and white tables. 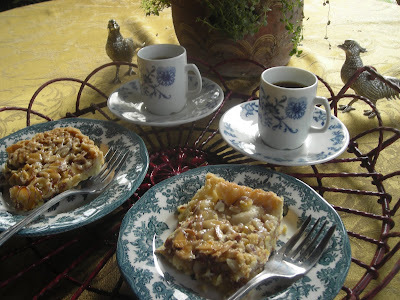 But then sometimes, I'll do all Spode -- cups and saucers, teapot, cake plate and dessert plates. 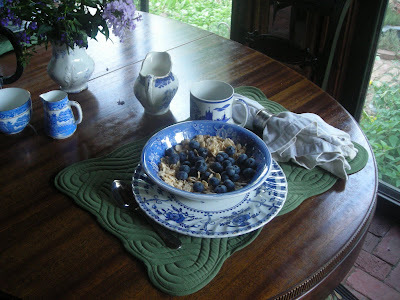 I love all blue and white dishes but do favor the English brands for tableware. I don't think I can ever have too much! And not only do all blues go together but blue goes with EVERY other color -- so I have unlimited choices in the kinds and colors of flowers for centerpieces and unlimited choices for tablecloths and napkins. 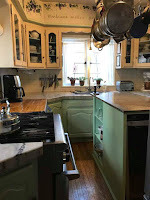 Please join Julia at Hooked on Houses and see what every one else is Hooked On! This is my first Hooked On post -- but I think I'm "Hooked On" Hooked On! Can One Ever Have Too Many Napkins?